As a full-service digital agency, Darwin Digital designs for responsive and mobile-first websites. In a time when the majority of people browse the web using a smartphone, it is imperative that your website is adapted to all platforms (desktop, smartphone, tablet) for the best user-experience. We will provide a bespoke design that represents your business and your customers. When 70-80% of your cliental land on your website using a smartphone, you should devote your time and energy to designing for mobile first use. Darwin Digital will build your website from the ground up for mobile means adapting your visual display and navigation for mobile screen size and touch-screen interaction. 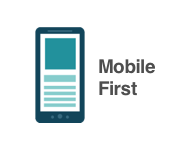 Mobile-first design goes beyond the aesthetics and also applies to the content and SEO of your website, as well as technical consideration like download speed. Darwin Digital designs all websites for mobile and desktop use. This responsive design applies to the majority or businesses, especially those offering B2B services and products or when user decision-making is made over multiple visits to one or many websites. 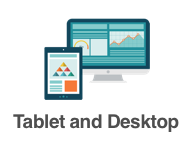 We design both wireframes and full-mockups for desktop and mobile devices. Depending on the platform the user is browsing from, we will not only adapt the design but also the displayed content.